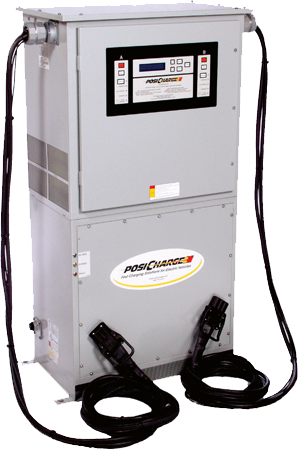 The PosiCharge™ DVS300/330/400 is the stand-alone industrial charger that can charge one vehicle with up to 500 amps or two vehicles simultaneously at 250 amps. DVS features ultra-efficient IGBT power electronics and an integrated AC to DC power server, delivering our customers significantly lower up-front installation and ongoing utility costs compared to other fast chargers. Our unique technology utilizes both temperature compensation and temperature foldback to accurately control battery temperatures during charging, adding an unparalleled layer of safety to fast charging. And like all PosiCharge chargers, the DVS works with a broad range of battery voltages and has the same data management and on-board intelligence. 2 Simultaneous charging for up to two vehicles with our smart fast charging technology.